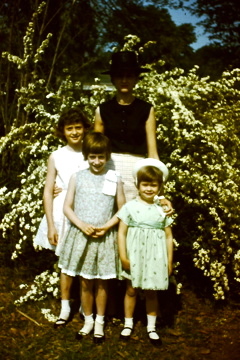 Easter Sunday (sometime before 1969). My mother, Martha Ann Dunn Thornton Wilcox, was so before her time! 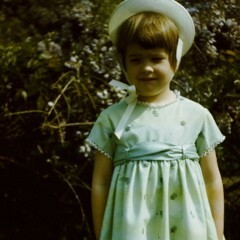 My name is Martha Elizabeth Wilcox (Irwin). I was named after my mother, Martha Ann Thornton (Wilcox). 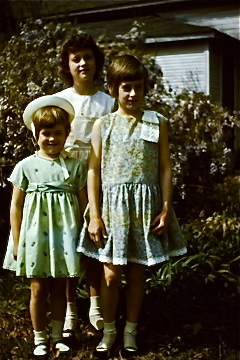 My mother, like most mothers of her time, did not work out of the house when my sisters and I were growing up in the 60s and 70s. But when she turned 50, she opened up an antique shop in Grand Cane, Louisiana. It was the year my first son was born. Before opening the Three Sister’s Antique Shop, my mother went on an antiques buying trip to Europe. She had been collecting blue transfer ware and wanted to go to England and Wales to find pieces for her shop. In order to get a passport, which she had never had, she needed a copy of her birth certificate. When my mother turned 50, she learned her name was Martha Ann Dunn Thornton. She was named after the nurse who helped deliver her…a Ms. Dunn. She had never known this was part of her name. Even stranger, one of my mother’s good friends and partner in antiquing, and the person that I thought of as a grandmother, was Eva Dunn. I guess we were family all along. I am not sure when I heard the story that my mother had originally wanted to name me Mary Martha, or from whom I heard it. The story goes that one of Eva Dunn’s daughters, Anna, talked my mother into naming me Martha Elizabeth instead. Mother enjoyed telling me tall tales and Anna was always joking, so it could have been either and it might not be true. When mothers die, they take part of your history with them…the part that you thought you still had time to learn. My mother’s older sister, Jo, was a school teacher. When we were growing up, she would give my mother books for us that came from whatever school she was teaching at the time. Not realizing that is where all the school readers came from, I asked my mother where we got all those books. She proceeded to tell me how she had been an English teacher and had taught school for many years. I was very excited to tell everyone at school that my mother had been a teacher. My mother was quite chagrinned at the next school function when my teacher at the time questioned her about her teaching experience. When picking out names for my children, I insisted that we call them by their first name. I didn’t want them to wonder on the first day of school, why the new kid wasn’t answering the role call. I also like names with many syllables, and good old Southern double names. My sons…Joseph Howard, Benjamin Levy and Zachary Thomas. I still love their names. My husband and I attended a school function for our oldest son when he was a senior in high school and I was quite surprised when the administration called him Joe. Once again, I am looking around to see who Joe is? I say, “Joseph, why are they calling you Joe, when your name is Joseph?” “I don’t know mom.” “What do you mean, you don’t know.” Joe says, “It doesn’t matter to me.” (Anyone who knows my oldest son, Joseph, knows that this was a very long and insightful conversation we were having.) Apparently, Joseph is Joe. Benjamin is Ben. Zachary is Zach. My boys have embraced these shortened versions of their names. My third grade teacher was Mrs. Porter, the mother of a friend and classmate. Her daughter, Judy, had the most gorgeous curly hair, which she wore cut short. She also had these beautiful dimples. Judy spent most of her early teen years trying to straighten her hair, while the rest of us spent our time getting smelly perms so that we could have curls. On many a lazy summer day, Miss Mary Ann (my emergency mom) and my mother would decide that I needed a perm. I think they were just bored. I would find myself choking on perm fumes, head over the sink in Miss Mary Ann’s bathroom. Miss Mary Ann and her husband, Mr. James had separate bathrooms. Hers was all pink tile. As a child, I thought this was luxurious…separate bathrooms, pink tile. At school and if I was at their house, Mrs. Porter called me by my full name, Martha Elizabeth. In the south, this name has an infinite number of syllables. It really irritated Judy and she would argue with her mother, “Mom, she goes by Elizabeth!” I secretly liked it, but I would have never taken Mrs. Porter’s side, over Judy’s. It was also in the third grade when I discovered the sound of my voice. We were doing a project that required us to record a reading. After recording, Mrs. Porter rewound the cassette tape and played it for me. Tears welled up in my eyes and started rolling down my cheeks. This wasn’t my voice. And I remember Mrs. Porter’s words to me exactly. She said, “It is okay, Martha Elizabeth, your voice will change as you get older.” She confirmed my suspicions, I have a very odd voice. It is hard to describe. I continue to be surprised by my voice (even at 52) when I hear it recorded. It sounds so different in my head. My sister, Pam, has the same voice. I am often confused when I hear myself leave me a voice message, until I realize it is Pam. Once when we were traveling through Mississippi, we went through a drive through, and I discovered my voice double as someone asked for our order over the intercom. Everyone agreed. I wished I had gone in and met my voice, but we were anxious to get to the beach. In the months leading up the to the birth of our first grandchild, a grandson, his mom and dad kept his name secret. They wanted to wait until after he was born to see if it fit him. For months, we called him Mr. Baby. At the Irwin House if you cannot decide on a name, you just put a Mr. or a Miss in front of it. We have had many a Mr. and Miss Kitty. When we were able to meet and hold our first Grandbaby after some family bonding time, we were introduced to Jack. Jack Thomas. I could tell when I called this gorgeous baby of loveliness “Jack Thomas”, that his mother really wanted him to go by Jack. Just Jack. His Grandmother and Granddaddy call him Jack Thomas. We will just have to be forgiven. On his second birthday, I added to his name…Jack Thomas “Sweet Baby” Irwin. Some people are amused that I always call my husband by his first and last name…Ed Irwin. His name just needs more syllables. Although when I call down from my sewing room to ask Ed Irwin to bring me a cup of coffee, I can just call out Ed. The name, Ed, can in some circumstances, have many, many syllables. I’ve been enjoying reading your blog. Love the stories about you and your family. And, BTW for the longest time I use to refer to Guy as, Guy LaChine. When I would talk about Guy, the reply would be, what guy! Thanks Toni! That is funny, I never thought about Guy’s name like that. And I do notice that you call him Guy LaChine! I notice Barbara calls Joe…Joe Burns too!